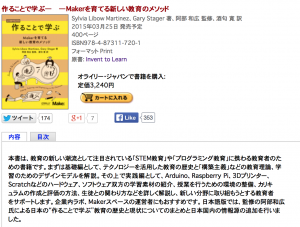 Invent To Learn: Making, Tinkering, and Engineering in the Classroom has been published in Japan! This is our first translation, and it’s very exciting to think that our message will reach a wider international audience. The cover says, “”Learn by Making: a new education method to raise a maker” and that there is an extra commentary by Kazuhiro Abe, the popular author of many books on Scratch in Japanese, on how “learn by making” philosophy has a place in Japanese history and education. Can’t wait to read this too!